Thanks so much to everyone who took the time to respond to my earlier post asking for opinions on my work! Apologies if there’s anyone I haven’t replied to personally yet, I’ve been trying to carefully digest every comment and give it the proper time to address before I reply. I had hoped that doing this would help me see weaknesses in my work objectively, and it really did, to an extent that I didn’t expect at all! The fact that enough people replied, and that many of the comments echoed each other in some way allowed me to piece together how other people see my work in a way that I’ve never done before, and what ended up being uncovered was not just weaknesses in working method, but a flaw in my entire attitude to artwork. What it seems to come down to is something that many people touched on, and Paul Fryer perhaps said best… I don’t have enough BEND. My characters aren’t alive enough, my figure drawing isn’t vital enough. In all my striving to be accurate, something along the way had become mechanistic, and I’d forgotten that the essence of storytelling (which is what I do just as much as drawing) is drama, exaggeration, distortion, that little bit extra that creates something more-real-than-real and makes up for the fact that art is only representative. 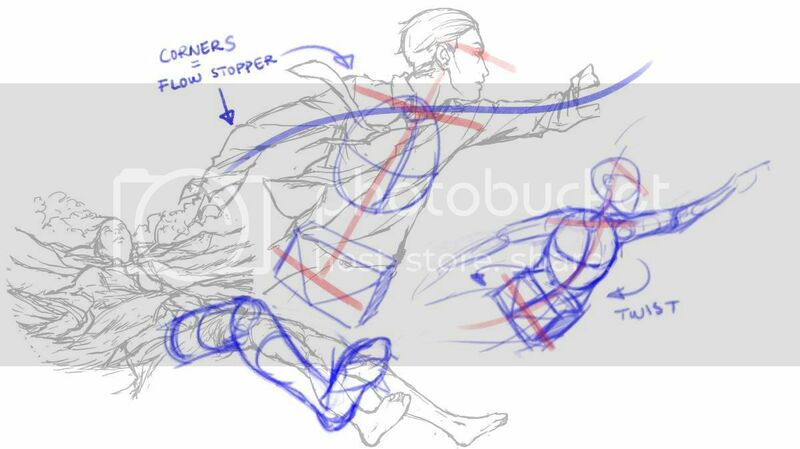 Kate also helped with the feedback, pointing out that not only do my characters lack that solid, grounded quality, but they each lack their own postural personality, they mostly “move” in the same way, striking the same poses, and bearing themselves in the same manner. It’s both uplifting and a little disheartening, to look back at my work and see it differently, to perceive the slightly stiff and floaty look that many people touched upon. These are the first drawings I’ve made since the feedback, and I’ve tried to incorporate what people have said. It’s a few elements from the rough of a page of Signal that’s currently in production, randomly placed together. I tried to produce the figures without specific reference, from the ground up. It’s hard to battle with habits that I’ve formed over years, especially whilst keeping the identity of my work intact, but it’s a start I guess. A number of people mentioned colour too, saying that my pallets and shading lack full depth, or seem a bit washed out. This is harder for me to judge, as it wasn’t feedback that “clicked” when I heard it, but it’s an area I’ll continue to look at closely. I think examples from other people’s work would help in this case. Please do continue to give me constructive feedback, even when I don’t ask for it specifically! I always want to look at my work critically, and this has been such a successful few days for that. It’s interesting to hear that the critique has helped you see your work in a new light. It makes me wonder what things I’m blind to in my work because I’m sure there are plenty. Sometimes you think that what you see the creator must know as well since they created it, but I guess we all have blind spots due to habit and fixed ideas. Sweet sketches! I’m feeling more fluidness here, although I’d say you could probably push your twists and bends even farther. It’s not a full figure here so I don’t know what’s happening to the lower body but from what I see it’s still looking pretty straight. If you pushed the opposing angles on the shoulder and the hips more it would loosen it up more. Also there seems to be something odd about the perspective on the leg in the other sketch. Thanks! I’ll check out that book, it sound like just the thing. I guess the only way to find out if there is anything that others see in your work that you can’t is to ask. It’s not been nearly as disheartening as I thought it might, since I think a good artists core ability is their visual acuity, hand control and ability to develop, not the specific way they draw at any given moment. P.S. your correction of the leg perspective confused me a little until I realised that it looks like those legs belong to the reclining figure, when really they’re from a separate panel and a different angle! Oops ^^; I’ve uploaded a new jpg to show how they’re separate drawings. Signal will be very exciting! It’ll be great to see you flex those artistic muscles! Will it be out for May expo or are you aiming for October?